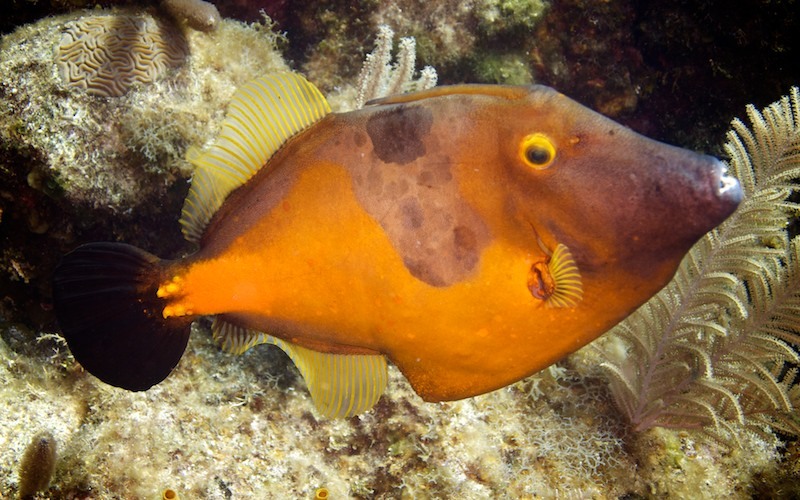 Caption: Leatherjackets, Whitespotted Leatherjacket, American Whitespotted Filefish and Orange Filefish. Found usually in pairs on clear reef tops with rich coral growth. They feed on invertebrates and algae. Length - 35cm Depth - 6-20m Widespread Western Atlantic & Caribbean Filefish can alter their colour and pattern to match their surrounds and so deter predators. Although closely related to the Triggerfish, their "trigger spine" cannot be locked into place.